Leaders of the world's top economies agreed Saturday to repair the global trading system as they closed a Group of 20 summit that saw the Trump administration at odds with many allies over the Paris accord on climate change and issues like migration. The joint statement signed by all 20 member nations said 19 of them reaffirmed their commitment to the Paris climate accord, with the United States, which withdrew from the pact under President Donald Trump, the lone holdout. The official communique acknowledged flaws in global commerce and called for reforming the World Trade Organization, but it didn't mention the word "protectionism" after negotiators said that had met resistance from the United States. 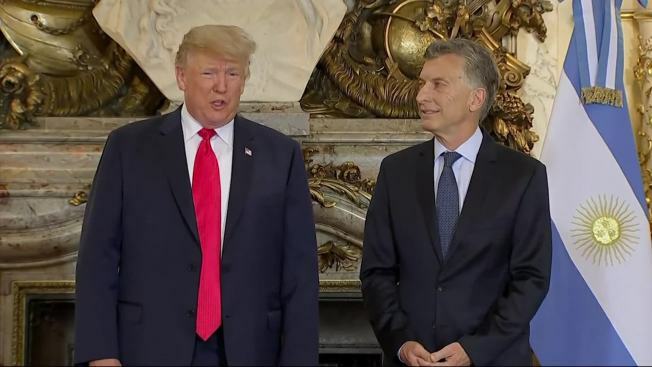 Applause broke out in the convention center hall as the leaders, including Trump, signed off on the statement at the end of the two-day summit in the Argentine capital, the first time it has been held in South America. The non-binding agreement was reached after marathon talks by diplomats stretched overnight and into daylight, amid deep divisions between member nations. European Union officials said the United States was the main holdout on nearly every issue. Trump has criticized the WTO and taken aggressive trade policies targeting China and the EU. 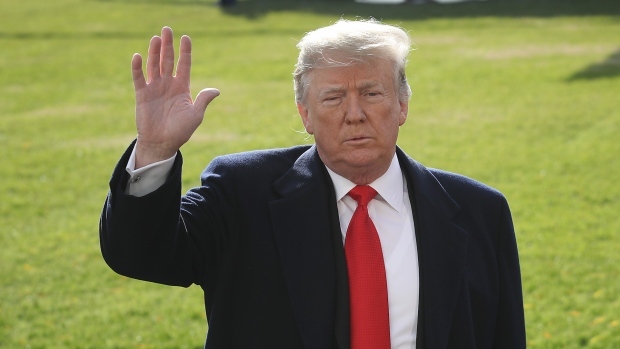 President Donald Trump tweeted Thursday that he would no longer be meeting with Russian President Vladimir Putin at the G-20 summit in Argentina after Russia seized three Ukrainian naval ships. But China also pushed back in talks on steel, South Africa objected to language on trade, Australia didn't want the statement to be too soft on migration and Turkey worried it would push too far on climate change, according to the officials. A senior White House official said the joint statement meets many U.S. objectives and stressed that it includes language about WTO reform. The official also noted other elements such as language on workforce development and women's economic development and a commitment by China to doing infrastructure financing on "transparent terms." On global commerce, the statement says the 20 countries support multilateral trade but acknowledge that the current system doesn't work and needs fixing, via "the necessary reform of the WTO to improve its functioning." On migration, European officials said the U.S. negotiator said too much talk about it would have been a "deal-breaker" for Trump. So they came up with "minimalist" language that acknowledges growing migrant flows and the importance of shared efforts to support refugees and solve the problems that drive them to flee. There were fireworks Friday on the first day of the G-20 summit. The gathering of the world's 19 wealthiest nations and the European Union included widespread protests in the streets and a much-anticipated meeting between Russian President Vladimir Putin and President Donald Trump. The U.S. and Russia were also able to reach an agreement on a cease-fire for southwest Syria. The statement also shows a commitment to a "rules-based international order," despite Trump's rejection of many of those rules. With trade tensions between the U.S and China dominating the summit, the Europeans sought to play mediator and also scaled back their expectations, cutting out mention of rising protectionism — mainly aimed at Trump. French President Emmanuel Macron called it a victory that the U.S. signed on to the statement at all, given the tensions going into the talks. "With Trump, we reached an agreement," Macron said. "The U.S. accepted a text." Thomas Bernes of the Canada-based Centre for International Governance Innovation, who has held leading roles with the International Monetary Fund, the World Bank and the Canadian government, said the G-20 had "veered all over the road" at the summit and failed to truly fix trade. The U.S. was out of step on migration and climate change and blocked meaningful agreement on those issues, he added. "Instead, leaders buried their differences in obscure language and dropped language to fight protectionism, which had been included in every G-20 communique since the leaders' first summit," he said. "This is clearly a retrograde step forced by United States intransigence." "The question is whether we are burying the G-20 in the process," Bernes added. "Certainly this is a big hit to the credibility of the G-20 to provide resolute leadership in addressing global problems." Summits like this "don't take away contradictions" among G-20 leaders, Russian President Vladimir Putin said. But he added that "these meetings are useful because countries that are fighting" can focus on problems they all agree on such as WTO reform. The summit statement's language on climate was welcomed by environmental groups such as the World Wildlife Fund and Greenpeace, the latter of which said in a statement: "The necessity of the U.S. being part of the effort to fight climate change cannot be denied, but this is a demonstration that the U.S. is still the odd one out." While a statement isn't legally enforceable, the Europeans see it as proof that the G-20 is still relevant and that multilateralism still works. "Everyone agrees that the WTO should be reformed," German Chancellor Angela Merkel said. "This is an important agreement." "We will send a clear signal — in any case, most of us" — for the success of global climate talks starting in Poland on Sunday, Merkel added. Merkel's spokesman said that during a meeting with Putin, she also voiced concern about rising tensions in the Kerch Strait off Crimea and pushed for "freedom of shipping into the Sea of Azov." Last weekend, Russia seized three Ukrainian naval vessels and their crews in an incident escalating a tug-of-war that began in 2014 when Russia annexed Ukraine's Crimean Peninsula and supported separatist rebels in eastern Ukraine. Germany and France have sought to mediate between Russia and Ukraine, and Merkel spokesman Steffen Seibert said she and Putin agreed that the four countries should hold further talks at the "adviser level." Macron and British Prime Minister Theresa May both said they had pressed Saudi Crown Prince Mohammed bin Salman for international involvement in investigating the October murder of dissident Saudi journalist Jamal Khashoggi at the country's consulate in Istanbul. May said she spoke to the crown prince about the importance of "a full, credible, transparent investigation that identifies those who are involved and that ensures that those involved are held to account." Macron did similar, but said bin Salman only "took note" of his demands and expressed hope the prince would respond soon. Turkish President Recep Tayyip Erdogan lamented that the issue of Khashoggi's killing was not a part of the official agenda and said the only leader who brought it up was Trudeau. According to Erdogan the crown prince's response was that Saudi Arabia cannot be blamed unless the crime is proven, something the Turkish leader called "unbelievable." U.S. intelligence agencies have concluded bin Salman must have at least known about the plot to kill Khashoggi. Saudi Arabia denies he played a role. Trump has said there is no definitive evidence the crown prince is complicit. "We want to know who ordered this assassination," Erdogan said, accusing Saudi Arabia of a lack of cooperation. Trump and Chinese President Xi Jinping met later over dinner after the summit's close. Their countries have been embroiled in an escalating trade war with new U.S. tariffs on China goods set to take effect a month from now. In closing remarks, the summit's host, Argentine President Mauricio Macri, said the countries had overcome "a number of challenges" to reach the statement. Putin said that when Japan takes over, "there will be proposals on perfecting (the WTO). This is already something." Associated Press writers Catherine Lucey, Almudena Calatrava and Geir Moulson contributed to this report.